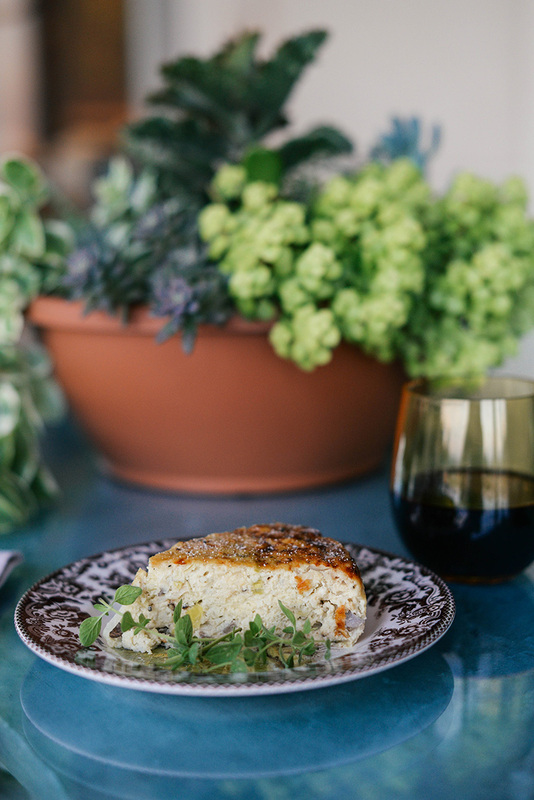 You may remember me whipping up this crustless quiche over on SnapChat about a month ago? I baked it again while I was in Austin per my mom’s request. It is SO GOOD. Not only that, but it’s pretty healthy (aside from the cheese). Definitely bookmark this recipe for the next time you plan to make brunch at home! 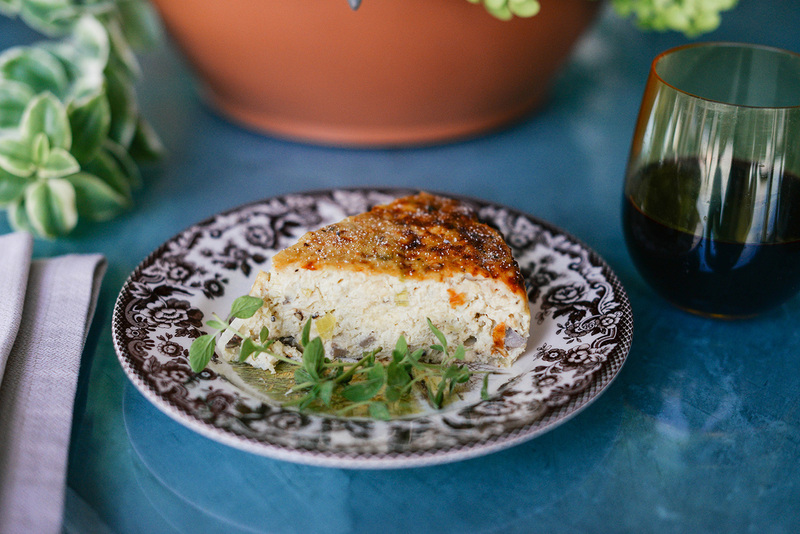 I should also mention this quiche can be reheated all week for breakfast – just cut a slice and pop it in the microwave. My mom thinks it would be easy to freeze for a later date too, but I haven’t been able to keep it long enough to do that… I end up eating all of it in just a few days! Heat oven to 425 degrees F. Cut up cauliflower into florets and toss in olive oil, salt and pepper (to taste). Spread florets into a single layer on a baking sheet and roast for about 25 minutes, stirring halfway through. Remove from heat and set aside once tops are golden and florets are tender. Turn oven down to 375 degrees F and line a 9-inch cake pan with parchment paper. 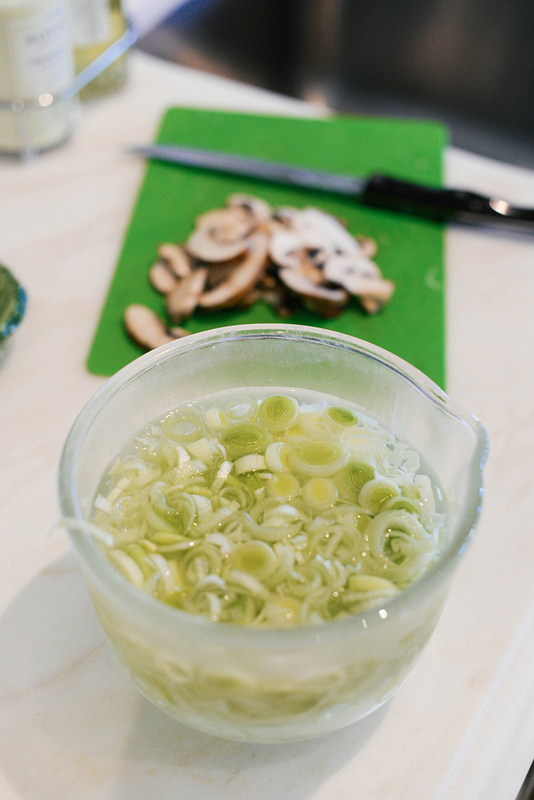 Slice leeks and place slices in a bowl of water to rinse any extra dirt off and separate slices from each other. Once fully clean, drain and set leeks aside. Place the roasted cauliflower florets in a food processor and pulse until florets crumble into rice-sized pieces, then set aside. Heat olive oil over medium-high heat in a large saute pant. Add in sliced mushrooms and sprinkle with salt and pepper. Saute the mushrooms for about three minutes until they are golden brown. Stir in the leeks and cook until tender, about 2 minutes. Add this mixture to the cauliflower and toss to combine. Set aside. Whisk together the remaining ingredients in a large bowl, and then pour in the cauliflower, mushroom and leek mixture – stir well. If you’ve got truffle oil on hand, pour about a teaspoon into the mixture and stir. Fold into the cake pan and bake until the center is puffed and top is golden brown (her recipe calls for 45 minutes, but I’ve needed more time for it to set – test it at 45 minutes, but it may need 5-10 more minutes to fully set). Remove from oven and place on wire rack to cool a tad before slicing! Drizzle the slice with truffle oil, or sprinkle with truffle salt (which you can buy at Trader Joe’s!) for an extra punch of flavor. So yummy! That looks so yum, I love crustless quiche! Dying to try this recipe! How delicious! Hope you had a great weekend. Looks so delicious Merritt! I’m going to have to try it as I’m on a Ketogenic diet and this recipe would work. Okay this is random question but are your mom’s dishes brown transferware? I love them and I’m considering buying a few. Is there a place she recommends to purchase them? Thanks! YUM – what a smart idea!!! And a girl after my heart with the truffle oil. Definitely adding this to my “to make” list!